Every vehicle in your fleet should fit your business needs and budget. There’s no sense in running a vehicle that’s too large for your logistics. When Tomalin & Son independent funeral directors wanted a new removal vehicle, they needed a smart but small solution which could navigate the narrow roads of their local area. Superior UK helped them find the ideal solution. Tomalin & Son’s previous removal vehicle was a a Mercedes-Benz Vito supplied by Superior UK. After several years, it was time for an upgrade. Manager Kris Philips worked with Jon Helm, Superior UK’s Southern Salesman, to find a suitable vehicle that could be custom fitted with an appropriate deck system. Kris was given free rein to research and source the ideal vehicle. 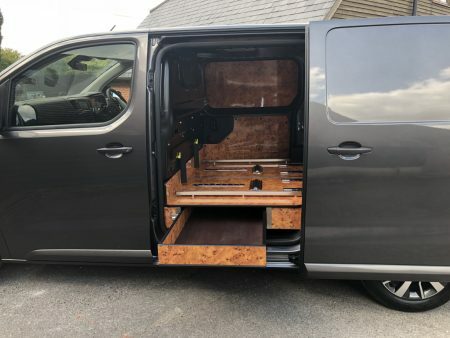 After an in-depth search, he came up with the new Toyota Proace van. Superior UK had supplied Tomalin’s previous removal vehicle, and Kris knew they had the experience and expertise to help kit out the new Proace. 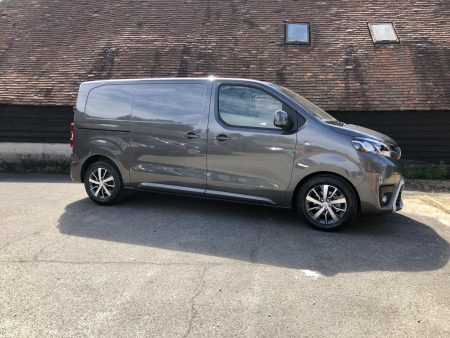 The Toyota Proace was an excellent alternative to the Mercedes-Benz Vito. It’s a new vehicle to the market and has a smart, dignified look (almost like a mini Vito). The size of the Proace is ideal for the type of deck Tomalin need. After some efficient consultations, Superior UK got the ball rolling. Kris ordered a new van from Toyota, who delivered it directly to Superior UK. As soon as it landed, the team at Superior UK started on the deck build. 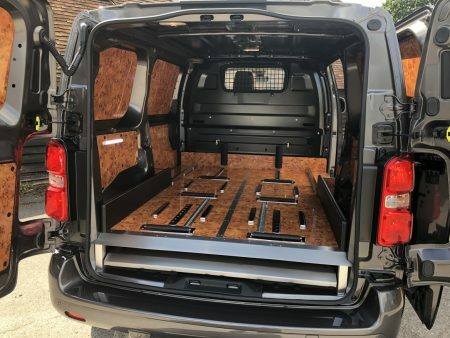 The Proace was transformed from empty van to a purpose-built removal vehicle in a matter of weeks. Superior UK always work with the customer to ensure their vehicle suits how they plan to use it. Jon took time to listened to Tomalin’s needs and understand which items they carry on a day to day basis. Kris is delighted with his custom fit Toyota Proace. The new removal vehicle was his project, and he couldn’t be more pleased with how it turned out. Tomalin now have a new removal vehicle which looks smart, dignified, and professional. It handles the narrow roads of Henley-on-Thames and will be an asset to the business as the weather turns cold and icy. Inside the vehicle is neat and tidy, helping Tomalin’s team carry out their duties efficiently and smoothly. Tomalin & Son is a locally owned independent family company which has been in the Jones family for over 60 years. They are situated in the heart of Henley-on-Thames. Superior UK are just down the road in Reading, but serve customers all over the UK and are present to oversee every vehicle delivery and handover.